A shortlist of 10 authors have been announced for the lucrative Impac Dublin Literary Award. 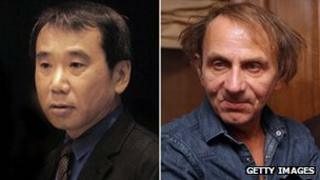 It includes Haruki Murakami and past winners Michel Houellebecq and Andrew Miller. The award, worth 100,000 euros (£81,000), is open to novels in any language provided they have been published in, or translated into, English. Last year Jon McGregor won for his third novel, Even the Dogs. This year's list includes City of Bohane by Irish author Kevin Barry, five novels in translation, one British and three American novels. Miller's book Pure, set in a Parisian cemetery in the run up to the French revolution, was named Costa Book of the Year last year. He won the Impac prize in 1999 for his novel Ingenious Pain. Controversial French author Houellebecq - who was awarded the prize in 2002 for his novel Atomised - has been nominated for his work The Map and the Territory, which features himself as a fictitious character. Murakami's book 1Q84 was described in its nomination as "a gripping, intelligent and unusual read with characters and situations that fascinate and challenge the reader". "This is a list of high quality literature that includes five novels in translation which readers might not otherwise get the opportunity to read", said Dublin Lord Mayor Naoise O'Muiri. "I am delighted to see an Irish author on the list." The 10 titles were nominated by public libraries in Estonia, Germany, Iceland, Ireland, Norway, Russia, South Africa, Spain, The Netherlands and the USA. Dublin City librarian Margaret Hayes said: "This is the highest number of books in translation on the shortlist since the award began and it is wonderful to have novels from Japan and Iceland as well as France, The Netherlands and Norway. "I urge readers to get stuck in and enjoy the humour and sadness, history and fantasy, teenage and elderly angst on this year's shortlist." The five member international judging panel will pick a winner to be announced on 6 June. The award is organised by Dublin city libraries on behalf of Dublin City Council.